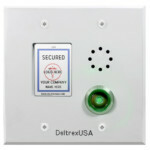 Our Intelligent Local Door Alarm or iLDA for short, is an innovative Bluetooth® enabled door alarm. The iLDA mounts into a standard two gang electrical box, powered from 10vdc-32vdc, has a built in 2.6” LCD showing various door conditions such as: Secured, Alarm, Held Open and others and uses the iButton digital key in lieu of traditional mechanical arm/disarm keys. Shunt/Bypass/Silence and other features can be performed locally using the iButton, iPhone or remotely from any Access Control System (ACS). iLDA provides four dry relays programmed via onboard jumper to allow for supervision: NC, 1K, 1K/2K. There is no need for external EOL supervision resistors. 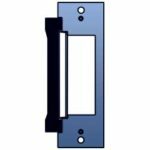 Outputs are Bluetooth® programmed to provide conditions such as: Alarm, Shunt, Held Open and “Door Mimic” for which there is no need to drill the door’s frame for multiple Door Contacts (DC/DSM). iOS Bluetooth users are divided into two groups: Managers and Security officers, each with unique rights. 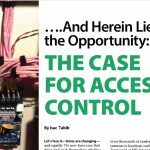 Flexible inputs allow for remote shunt, remote bypass, remote reset as well as “Lock Voltage Sense” for both Fail Safe and Fail Secure 12VDC/24VDC locks. 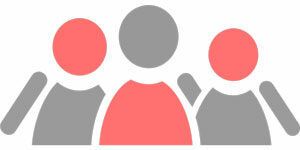 Local built in Database allows for validating/invalidating over 50 “digital key” users. The iLDA is available with or without LCD display. LCD allows integrators to enter 5 lines of text and/or their end user’s Logo. In addition to many other built in features, the iLDA can be custom programmed as per customer’s requirements. 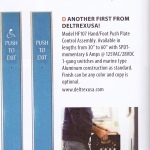 DeltrexUSA has crafted their own machine to test the longevity of their customized push plates. 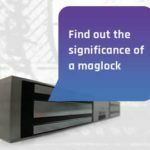 Our machine has pushed our product approximately 600,000 times! 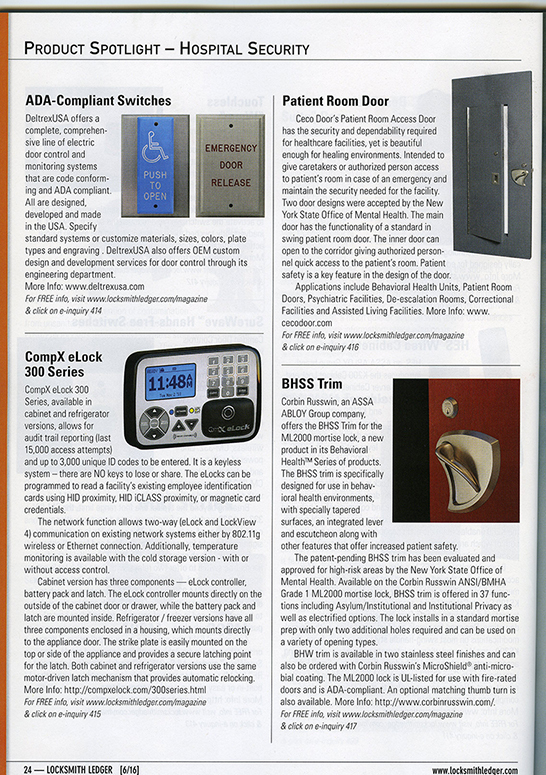 The Vice President of DeltrexUSA, Isac Tabib, has published a second article in the April 2016 edition of the “Doors & Hardware” magazine. To read more about this, please download a copy of his article by clicking here. 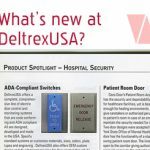 DeltrexUSA’s own “Vice President of Technology”, Isac Tabib, has published an article in the March 2016 edition of the “Doors & Hardware” magazine. 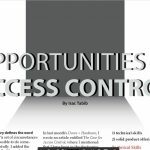 His article elaborates on the access control systems and his goal to “make it a functional and compliant system, while reducing high maintenance costs for our customers and ourselves”. To read more about this, please click here or on the link provided below.